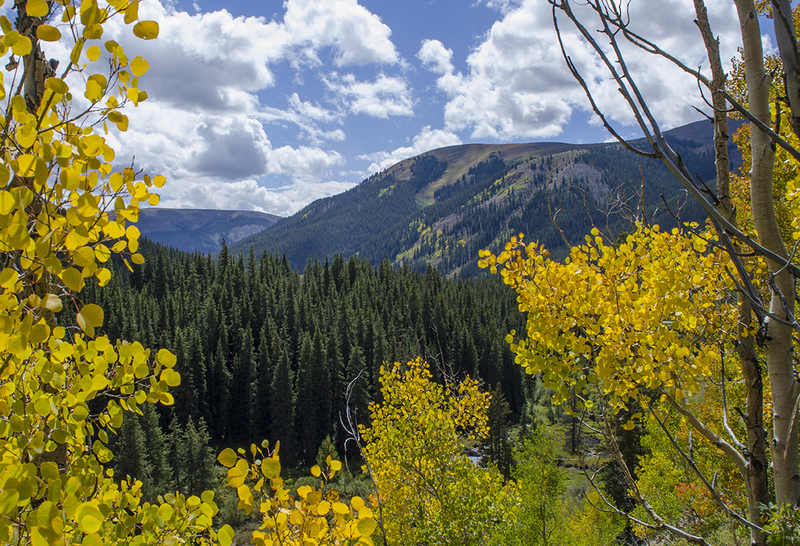 Colorado’s fall color explosion begins in early September with high country aspen beginning their golden exhibition deep in the central and northern mountains. While there are many places I would love to go to view the aspen in their colorful fall garb, this time, I stuck to the central mountains so that I could make it home in time for the evening Broncos kick-off. Still, my little ole car ended up with more than 250 miles in this round-trip jaunt. So, where did I go? To the Top of the Rockies Scenic and Historic Byway, the 10th Mountain Division section of the byway that is. First, let’s get to the color and yes, there were some aspen which were already breaking free of their summertime green exploding into gold with a little bit of orange and rust thrown in for good measure. All along the drive from Minturn to Leadville, aspen were changing in pockets of gold. The most dramatic views were along the Battle Mountain drive. Pockets of gold along 10th Mountain Division Highway. The road along this drive climbs high above the Eagle River and the aspen hug the steep hillside only stopping when the hill gives way to dramatic black, red and rust-colored cliffs. I thoroughly enjoyed myself, stopping at almost every pullout, soaking up the scenery, breathing in the cool fresh mountain air and taking in the colorful scenery. Not even the dark clouds that drifted over the mountain range could keep me from feeling completely delighted. Luckily, the storm clouds during my drive came and went pretty quickly, leaving amazing blue and puffy white-cloud skies behind. With the green and gold covered hillsides and red colored cliffs in the background, I was in complete awe of the scenery. Now, let’s move on to the history of this byway. 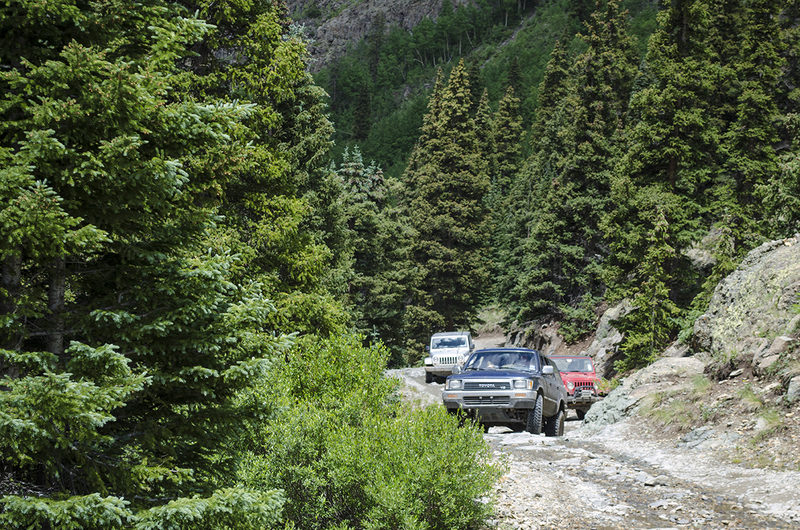 There are two major historic distinctions along the byway between Minturn and Leadville. One is a rich mining history and the other is a military history. In between Minturn and Red Cliff is the abandoned mining town of Gilman. Now, while this town is an abandoned ghost town, the age of many of the buildings in this town are not as old as one might think, because the town was last inhabited in 1984. That’s right, I said ‘19’ – 84…only 30 years ago. So, what happened? Well, the zinc extraction industry went belly up (with rock-bottom zinc prices) and the town was condemned by the EPA…that’s it in a nutshell. Check out the Substreet blog for more historical information and lots of photos of the town and surrounding area. 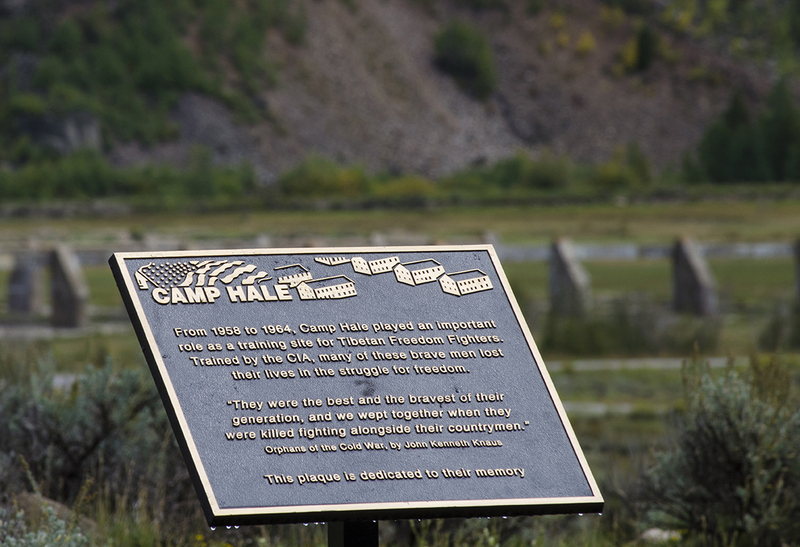 As for the military history…well, that comes in the Pando Valley area of the byway, now called Camp Hale for the military operations that took place there during WWII. 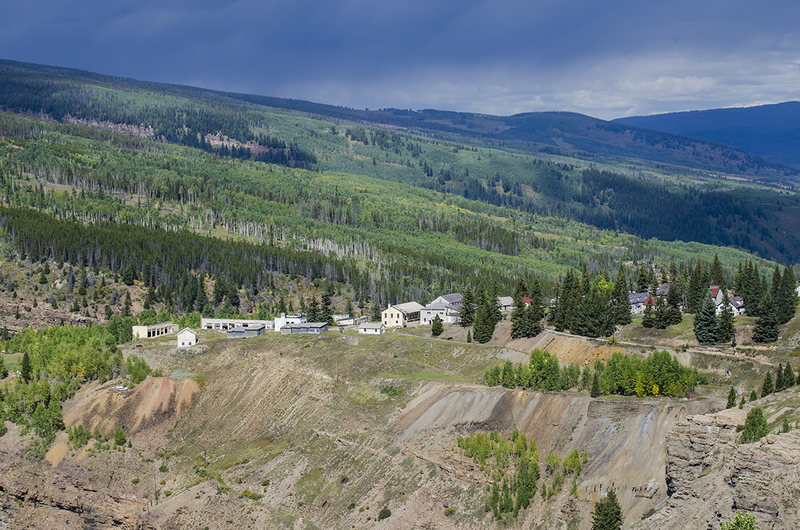 Camp Hale is located between Red Cliff and Leadville. Many of its distinctions include ski training operations of the 10th Mountain Division as well as a secret CIA training camp from 1958 – 64 with the Tibetan freedom fighters. Check out the linked website for interesting information on all the activities that took place there. When you visit the area now, you might see a few long forgotten cement walls, some sort of road system which has been almost completely covered by natural vegetation and hopefully you will never come across any, but munitions are still being recovered by the military in its cleanup of the area. Note: if you do a google search for Camp Hale on Goolge Maps and turn to the satellite view, you can still see the outline of the camp buildings and road system. When I stopped at the roadside pullout which memorializes the secret CIA and Tibetan training operations, I got out of my car just long enough to watch the storm clouds which had been chasing me since Battle Mountain blow down into the valley, completely engulfing the mountainsides, leaving nothing in view except for a thick mist. Camp Hale Tibetan freedom fighters memorial plaque. I took a few shots before the rain began and then hid in my car as it blew through and then quickly retreated through the other side of the valley and over another mountain range. The smells left behind were thick and rich with scents of pine and late summer. Soon, the clouds broke and gave way to a perfectly blue sky dotted with puffy white clouds. I was in heaven and lingered for a while longer before continuing on to Leadville. One other historical note to mention and this piece of history unfortunately has no name, although it’s known as cabin in the valley according to a photo I found on a Google search. On previous jaunts in this area, I had always just cruised past this broken and falling down cabin, but this time, I stopped. When I approached the cabin, I noticed that it had two distinct rooms. This was different from other old relics I had come across in the Colorado Rockies, so I made sure to take as many photos as I could from different angles before leaving the area. 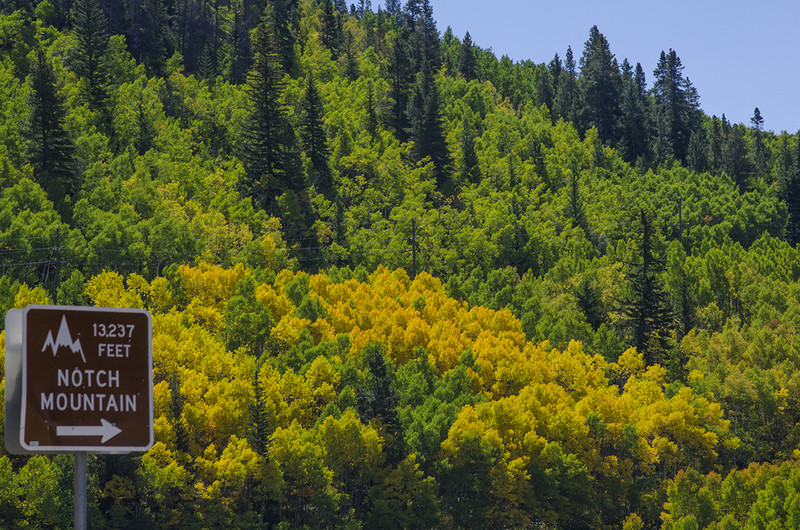 Oh and just so you know, the last leg of the byway from Leadville to Copper Mountain also has a ton of colorful aspen viewing right along the byway. It definitely is worth taking a whole day to linger along the drive if you go. Looking southward from the road to Freemont Pass along hwy91. Maybe even take a train ride in Leadville during this time of year to capture the changing aspen with an historical train as backdrop against the high mountain peaks. Check out the Leadville Twin Lakes website for more information on the fall train tours. If you plan on touring the full byway, make sure you do it in summer, since the top of Independence Pass is closed in winter. The furthest end of the byway takes you to Aspen, so be sure to bring a fully packed wallet as well. Orange and rust aspen leaves along Battle Mountain road. Above Alma Colorado on the south side of Hoosier Pass. Aspen waterfall near Camp Hale. Aster after the rain in Camp Hale. Wild rose bush in scarlet. Daisies near the Eagle River and Minturn. Pockets of gold along 10th Mountain Diviision Highway. Camp Hale in the mist. The valley below Leadville along hwy 91. Water trough above the Eagle River near Minturn.